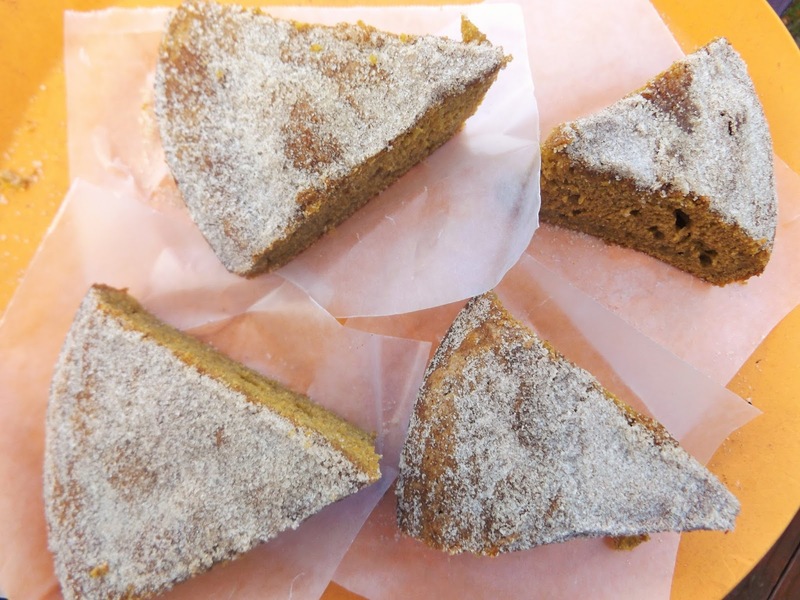 I am not even going to attempt to tell you just how important pumpkin was, and is, the New Englanders. Let me just begin by giving you just a smidgen of the pumpkin recipes I have in my library for you to look over for your next gathering. Let's begin! These cinnamon roll-like treats create a type of caramelized glaze both on top and on bottom with a sweet crunch in the middle of every bite. 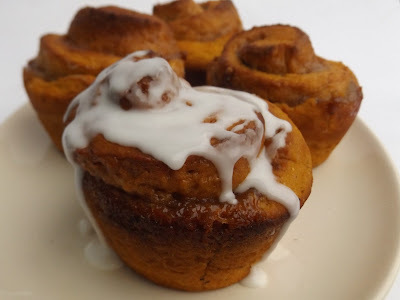 When combined with the great flavor of a pumpkin streusel pie I think this will quickly replace the classic cinnamon rolls so often loved. Want to serve this up on your Holiday morning? Simply coat the top of each roll that has been placed in the muffin cups with nonstick cooking spray, loosely cover with film wrap and refrigerate overnight. In the morning, crank the oven and bake! Add milk, molasses and sugar to a large mixing bowl, whisking until well combined. Sprinkle yeast over the top and let sit for 10 minutes, or until frothing. Add pumpkin, butter, salt, cinnamon and nutmeg, beating until smooth. Add flour all at once and continue beating, on low speed, until all the flour has been incorporated. (Unlike regular bread dough, this dough will not leave the sides of the bowl, it should be very soft). Cover and let sit on the counter in a warm spot of your kitchen until about double in bulk. Liberally grease a 6-cup muffin tin with nonstick cooking spray. You can also use a mini muffin pan as well, just cut each roll half the thickness as described below. In a bowl, combine streusel ingredients(except maple syrup) and mix with a fork until even in color and texture. Liberally flour a work surface and empty out bowl of dough. Knead dough, bringing up the sides and folding it into itself for about 2 minutes, until it is no longer sticky. Add more flour as you knead and use a dough knife if needed as well. Roll out dough to about 16-inches in length to 10-inches wide. Spread maple syrup to within an inch of all sides. Sprinkle streusel evenly over the top, to within an inch of the sides. Start rolling tightly from the long end in front of you, ending with the seam-side down. Cut into 6 equal-sized slices and place each into greased cups of muffin tin. Set aside to rise once again to about 50% larger in volume. Preheat oven to 350-degrees F and bake rolls for 25 minutes, or until when pressed toward the center, it bounces back and the top is crisp. While rolls are baking, prepare glaze by mixing powdered sugar, water and vanilla together until smooth; set aside. Remove from oven to cool slightly before running a knife around the edges to loosen. Lift each out to glaze while hot and serve. NOTE: If you don't have molasses, simply substitute 2/3 cup brown sugar, lightly packed. 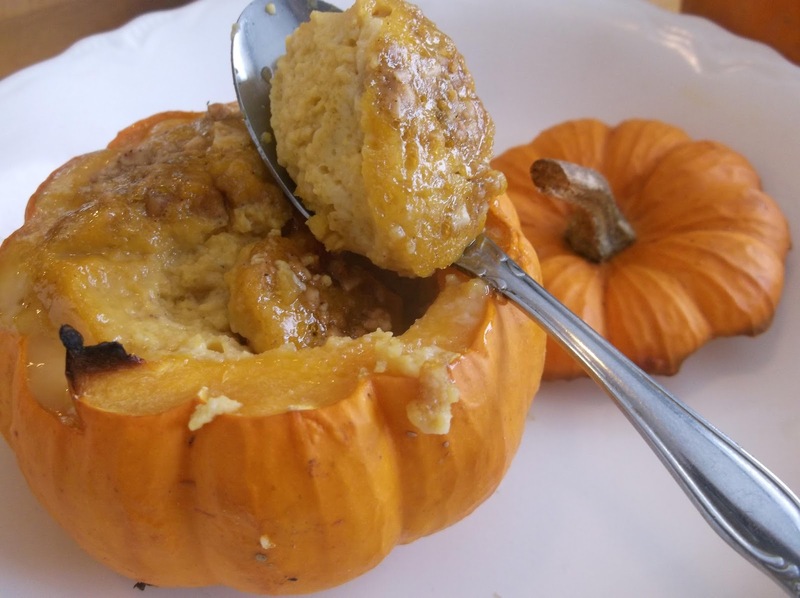 Place hollowed out pumpkins on a very lightly greased baking pan and evenly divide corn mixture into each pumpkin, leaving 1 cup aside. Place tops of each pumpkin alongside each filled pumpkin and bake about 20-30 minutes, or until each pumpkin is soft but not starting to cave in or droop. Remove from oven and serve, with the additional corn mixture evenly topping each, reheating if needed. 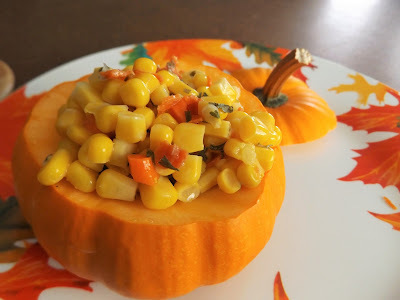 Serve with pumpkin tops. This truly is the most moist sweet bread recipe around. The added touch of cinnamon/maple swirl in the center just sends the taste off the edge. After eating this entire loaf among me and the kids, honest to goodness nobody had one single crumb on their plates. Preheat oven to 350-degrees F. Grease a 9-inch loaf pan with nonstick cooking spray; set aside. In a large bowl and using an electric mixer, beat butter and brown sugar on high speed until well combined. It may not be smooth because I cut back on the butter, but if it resembles crumbs, that is perfect. Add eggs and beat well. Add eggnog, pumpkin, 1 tablespoon cinnamon, baking soda and nutmeg. Continue beating, on low speed, until everything is evenly blended. Add flour all at once and beat until it just comes together. In a separate, smaller bowl, mix together granulated sugar, remainder of cinnamon with maple syrup until well blended. Pour half the bread batter into prepared pan. Drizzle maple mixture right down the center(it will be think) and add remaining batter over the top. Lift up a couple inches from the counter and drop a couple times to remove air bubbles. Bake 1 hour and 10 minutes, or until when touched in the center, it bounces back. Make sure you put a larger sheet pan underneath the loaf pan to catch any maple mixture that may bubble up over the sides. Remove from oven, loosen the sides with a butter knife and let cool enough to transfer to a platter. 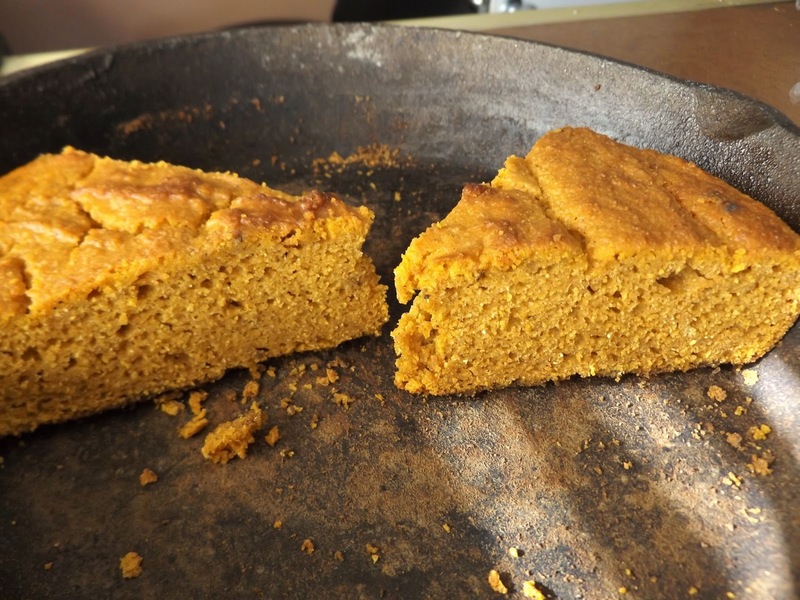 A great cornbread that truly showcases the flavors of our grandparents and far beyond. 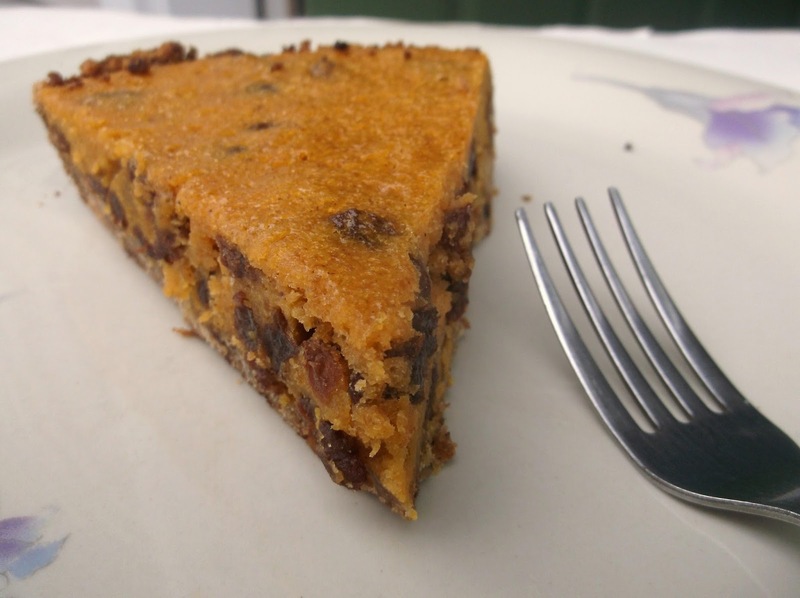 This recipe reminds me so much of Baked Indian Pudding, but with the classic texture of brittle(but not too brittle)corn bread. This is one of those rare bread recipes that you can substitute gluten free flour to without negatively affecting the texture. This is a keeper. Preheat oven to 375-degrees F. Grease a 9-10-inch oven safe skillet(cast iron is, of course, the best) with a liberal amount of nonstick cooking spray; set aside. 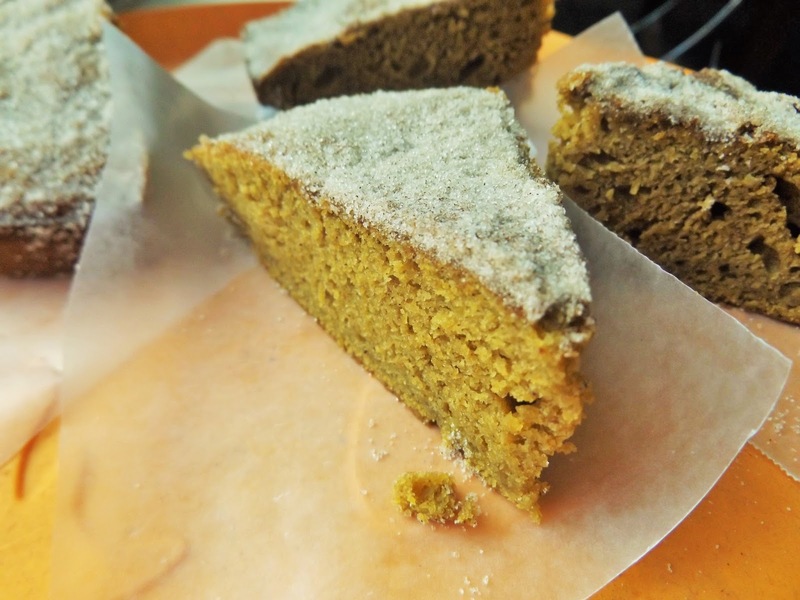 In a large bowl, combine cornmeal, flour, sugar, baking powder, cinnamon, salt and nutmeg. Add eggnog, pumpkin and molasses, stirring very well. It does not need to be lump free. Pour into prepared skillet and back 44-46 minutes, or until cracked on top and when pressed in the center, it pops back up. Remove from oven to cool slightly before cutting into wedges to serve warm. * Vanilla eggnog is excellent here as well, or even try caramel flavored eggnog. Not quite a pie, not quite a custard. This deliciously moist dessert is light, airy and bursting with that warm, 'cuddly' taste, if that makes sense. 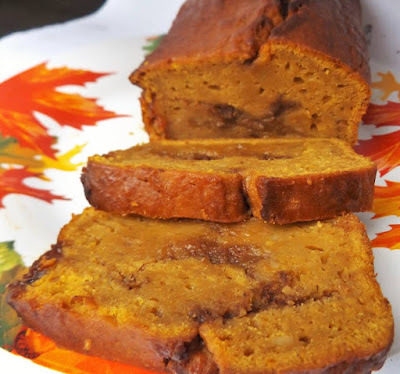 There is just something about the smell of pumpkin cooking that instantly puts a smile on your face, and this treat will put a smile on even that one relative that is a little hard to crack. Preheat oven to 350-degrees F. Cut off the stem end of each pumpkin, about a quarter of the way down. 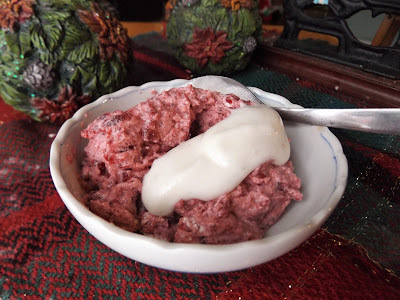 With a spoon, scoop out stringy flesh and seeds; set aside. In a small bowl, add apple jelly and microwave for 15 seconds, or until hot. Remove, add lemon juice and whisk smooth. Scoop out 1 tablespoon of jelly to another small bowl and stir in the chopped nuts, mixing well; set aside. In a large bowl, whisk pumpkin, remainder of melted apple jelly, eggs and pumpkin pie spice. Evenly divide among the hollowed out pumpkins. Place on a pan and gently sprinkle prepared nuts on top of each so that they don't immediately sink into batter. It is fine if some do, they will rise back up as they are in the oven. Bake 50-55 minutes, or until the filling has puffed up and is firm to the touch. Remove from oven to cool 5 minutes before serving. Or if desired, refrigerate completely before serving. Not too spicy, not too mild. 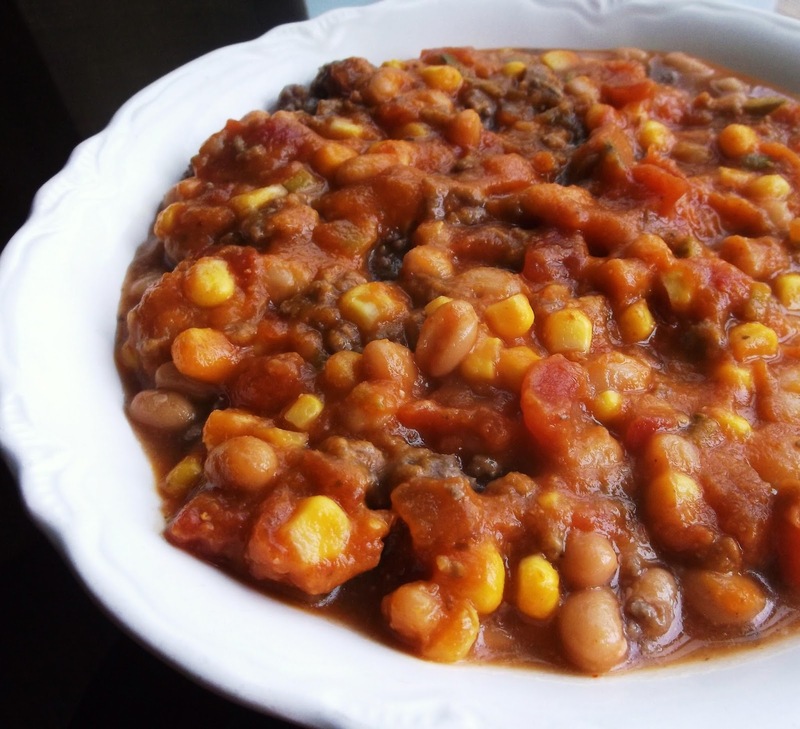 The sweet taste of pumpkin works well to tone down any heat, but if it is fire that you want, simply mince a couple hot peppers and cook along with the onions and bell peppers. Dollop some sour cream on top and sprinkle shredded Monterey Jack cheese if desired. In a large saucepan, over medium heat, add oil. When oil is hot, add onion and bell pepper, cooking until softened, about 3-4 minutes. Add chicken, continuing to cook until chicken is thoroughly cooked through, stirring frequently to break up. Add remainder of ingredients, stir to combine and reduce heat to low. Partially cover and allow to simmer for 15 minutes. Serve hot. Anyone remember the childrens show Doodle Bops? My children loved it! So this cake is now a standard in my home not only in title but because the flavor is reminiscent of a Snickerdoodle cookie as well, of which every child loves. A softly scented cake that can just be grabbed by a childs hands and eaten.....of course you may want to follow them with a vacuum. Grease a 9-inch cake pan with nonstick cooking spray; set aside. Preheat oven to 350-degrees F. With an electric mixer, beat butter with brown sugar until blended well. Add applesauce, pumpkin, egg and vanilla, continuing to beat until thoroughly mixed. Ordinarily, and classically, Waldorf Salad would have grapes but I think the tang of cranberries that have been plumped up with grape juice brings this recipe to a whole new level. And when lemon curd is added and this perfect Holiday side dish and presented in a mini pumpkin, you will be handing out this recipe to everyone who asks......or will you just keep it in the family? Cut the stem ends of each pumpkin off. With a spoon, dig out stringy flesh and seeds; set aside. Place grape juice, cranberries and raisins in a small saucepan and bring to a boil over medium-high heat. Reduce heat to medium-low and simmer 10 minutes. Remove from heat and let sit for 30 minutes. When ready, peel, core and dice apple to equal about 2 cups total; set aside. In a small bowl, whisk the lemon curd, mayonnaise and Chinese 5-spice powder; set aside. Strain cranberries and raisins if all the liquid has not been absorbed and discard any remaining liquid. Add to a bowl with apple, celery, walnuts and mayonnaise mixture. 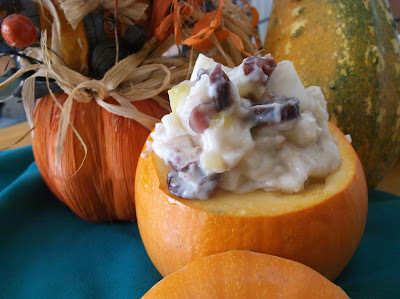 Cover and refrigerate at least one hour before evenly dividing among the prepared pumpkins and serving cold. Jefferson Davis has been punked......with 'punkin, that is! 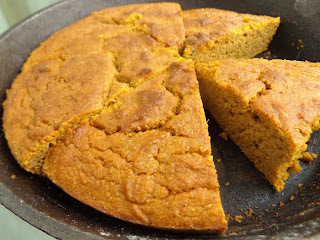 Want a great, timeless Southern pie with a Yankee influence that tastes exactly like a "punkin' chip cookie? Both North and South are equally represented here in a dessert that is outrageously good. Classically, Jefferson Davis Pie is made with egg yolks but replacing them with egg substitute works equally as well. Go ahead and use 4 egg yolks and 2 whole eggs if desired. Preheat oven to 325-degrees F. In a bowl, combine cookie crumbs with melted butter. Transfer to a 9-inch pie pan and press against the bottom and up the sides; set aside. In a large bowl, beat butter and brown sugar until smooth and creamy. Add egg substitute, pumpkin and vanilla, continuing to beat on high until well incorporated. Reduce speed to low and beat in flour, cinnamon and nutmeg. Using a spoon or rubber spatula, fold in the raisins and chocolate chips. Pour into prepared pie shell and bake 32-34 minutes, or until the center is firm to the touch. Remove from oven to cool slightly before serving. This pie is even better cold. 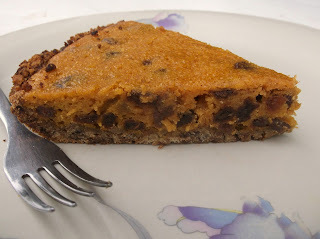 * To stay as close to original as possible, substitute the chocolate chips for chopped, dried apricots, chopped dates or even some candied fruit for the Holidays. I, as every single other Yankee, grew up having one syrup and one syrup only with our pancakes, French toast and waffles. Some of us have even poured it over a sandwich or two as a child. 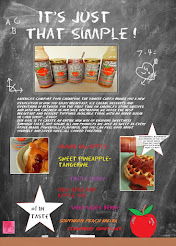 There simply is no other syrup to use for these breakfast items and never has been. Our bodies, minds, spirits and blood run solemnly and slowly with the maple syrup of today and all the yesterdays since we began our journey here in the rocky barrens of New England. Then came a day when I was judge of a local festival and was looking for sponsors as part of a gift basket to go along with cookbooks, kitchenware, gift certificates and money. I happened upon Maine Man Flavahs, who had the most extraordinary hot sauce, made with Maine wild blueberries, I had ever tasted. Then came a package from Bar Harbor Jam Co. that had the best wild blueberry syrup in the world. And I am not exaggerating on either account. In fact, my children would NOT eat pancakes or waffles now without blueberry syrup. I began to think (of what I would have already thought)a syrup that screamed New England other than blueberries. Can you think of one other fruit or berry that is simply a moniker that means New England? Oooohhh, I can.....apples! There MUST be an apple syrup somewhere around. For the entire summer I searched high and low for a perfect apple syrup but I could not find even one syrup whose main(or #1)ingredient was anything other than corn syrup until I took a look on the shelves of my favorite apple orchard anywhere in New England. Not only is Treworgy's Family Orchard the entire reason for penning my third cookbook(seen on the right of this post) but as I was gleaning the shelves in their store for anything that remotely resembled pancake syrup, one little bottle caught my eye. The green Made in Maine label was enticing enough for me to dig for my glasses. On they went and I grabbed the "cider jug" looking glass bottle and what do you know! APPLE SYRUP!!!! I didn't get my hopes up much because right next to it was another bottle of apple syrup without the green Made in Maine tag. Being a scrutinizing kinda feller I am, I turned each over, just hoping the first word in the ingredient list was NOT going to be corn syrup. Sure enough, the first bottle was corn syrup. I looked at the bottle in my right hand. Squinted, moved the green tag and read "FRESH McIntosh apple juice, sugar, cinnamon, allspice and cloves..." I immediately turned the bottle around to see the name of this syrup. 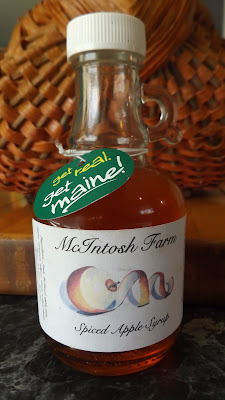 Spiced Apple Syrup from McIntosh Farm, in Madison, Maine. I placed the other bottle back on the shelf and did something I have NEVER done before in my life. Paid for something without looking at the price tag. It just didn't matter, I had the real deal. And when I explain the syrup itself below, it may seem like I am taking poetic license, being paid for this review and am getting a life time supply but you could not be further from the truth. This syrup is so good, authentic, aromatic and perfect, it is going to be in every single food column I write for print around the country. McIntosh Farms nailed it! And I mean drove a spike through anybody else who may think their apple syrup outshines this one. It just isn't going to happen. Once you open this bottle, make sure nobody else is looking and close your eyes, Take a smell and tell me what instantly comes to mind. To me, it was Grammies kitchen. It was the most desirable apple pie being baked in an old time oven. It was the best, most vibrant apple cinnamon candle you could buy. It was the smell of apples and spices simmering on your stove all day long, and into the night. I could go on and on, but it was much more than just apples and cinnamon. As the label says, a deeply aromatic blend of spices that were just as true in flavor as in aroma. Now my children and I have another syrup to chose from instead of maple syrup. Don't get me wrong! 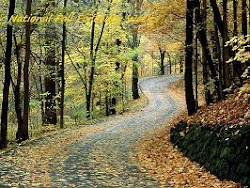 I adore maple and the essence of maple drifting from room to room first thing in the morning. But when you combine that sweetness that you crave with pancakes with a fruity flavor of Maine mac's, there is absolutely nothing more I can add to this bottle, even in words. I highly urge you to seek out this company and buy a bottle of this syrup. ....NO! Buy 2 bottles! Keep one at home and sneak one as a gift to a family member or friend. I was floored, and you will be too. The search is over now. 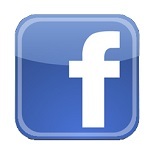 Take a look for yourself on Facebook here or on their website here. For those of you who are unaware of what hundreds of thousands of us Mainers have gone through the past week and continue to go through, let me give you a brief description. A "wicked" wind storm blew through our State Monday creating such havoc that we haven't seen the same since the great ice storm a decade ago.. Many homes went without power and a generator and continue to go without as of this posting. My family was without electricity but we were fortunate enough to have had the gift of a generator that helped feed my family a hot meal, unlike many thousands of others. At CCES, Central Community Elementary School in Corinth, Maine, children found refuge from the cold and were able to eat a hot meal while in school, which for many was the ONLY hot meal they had during the week. My family and I have extended a hand and offered to pay for any hot meal these children wished to have for November 2 and 3. This will assuredly run into a lot of money so this is why I am posting this offer below. AND pay one particular attention to what my 6 year old son is doing as well. There are a couple different options for you. The first would be to contact either me or CCES and donate directly if you would like. For just $4, you can help with the cost for 1 student for both days. 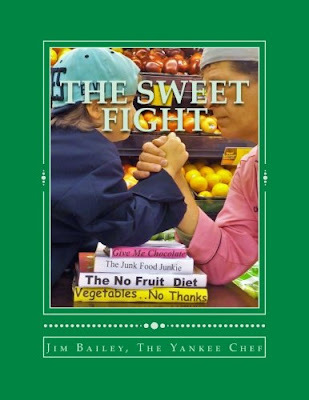 Or you can buy my latest cookbook, called The Sweet Fight for $19.50. This price includes having the book shipped to my home, signed by both of us and with a personalized message from both of us thanking you for the help with this cause. I will then package and ship it to you. This offer holds true to the Kindle version of my book as well. 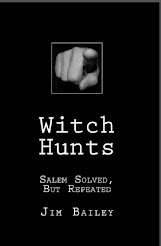 All proceeds from Kindle for the next 10 days will be used toward this cause. The last option is a great one. 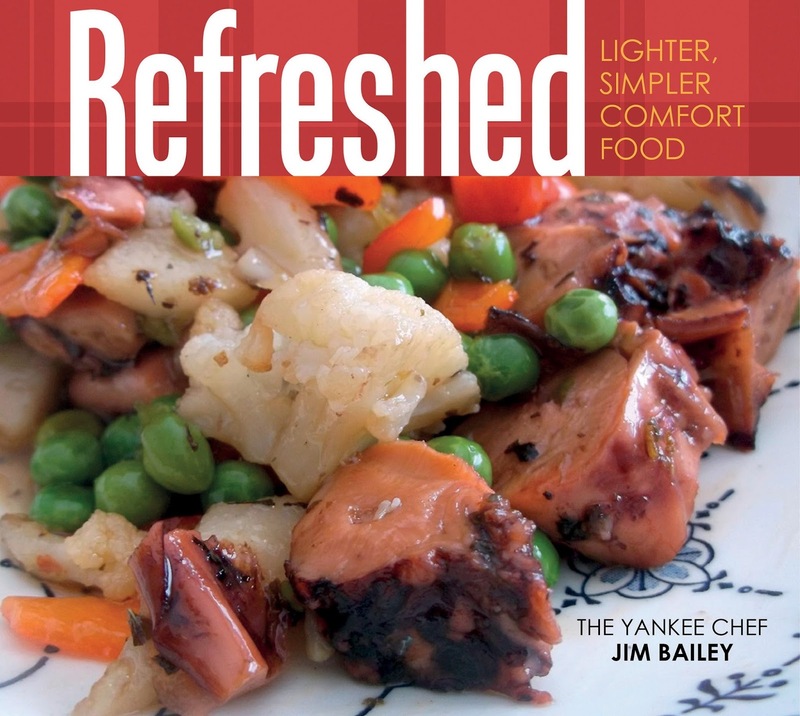 You can purchase BOTH my second cookbook AND my third cookbook(entitled REFRESHED) for $35 with the same shipping as above. 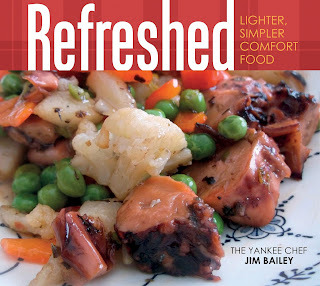 BUT, I only have 5 REFRESHED cookbooks left. If interested, message me here and I will forward my address so that you can mail a check or money order. On November 15, I will send in the order and get the ball rolling. All orders must be prepaid as soon as possible. I can't tell you how meaningful this is to me, my family and those kids who will were benefited by your kindness. AT the very last, I would adore any and all SHARES of this post. Again, thank you for your kindness.